A large population of Louisiana Waterthrush (LOWA) and Worm-eating Warblers (WEWA) use the TN River Gorge to breed each summer. Since the LOWA relies on clean, healthy streams, while the WEWA relies on forested slopes with dense vegetation, their presence can tell us a lot about our forests. Louisiana Waterthrush (shown above) are Neotropical songbirds that have been identified as a "species in decline" by the regional authority on bird population health, Appalachian Mountain Joint Venture. However, LOWA populations are on the rise within our specific region, making the Tennessee River Gorge an area of regional importance. LOWA serve as stream health indicators because they feed on macroinvertebrates such as mayfly larvae which are only found in healthy water sources. At the Trust, we want to understand what pressures are causing this unique bird to decline and the status of our own populations. In the summer of 2016, we deployed geolocator data loggers on sixteen LOWA as a pilot project to learn more about their full life cycle. These geolocators map the LOWA's migration routes and wintering grounds by measuring ambient light levels in association with time of day. This data can only be retrieved directly from the geolocators; thus, we must recapture the geolocator-carrying LOWA upon their return to the Gorge in the summer of 2017. Since LOWA often return to the same summer breeding grounds year after year, we are able to successfully and safely recapture LOWA as they return from their southern wintering grounds. We have successfully recovered five of the geolocators, each of which contains exceptionally unique data on their migration routes and specific winter locations. The data revealed that the LOWA migrated to various locations within Guatemala and Southern Mexico, a round trip of over 3,000 miles! This project has been one of the first successful attempts at tracking the migration routes of the Louisiana Waterthrush. With this research project we have opened the door to better addressing threats to LOWA and their habitat – whether they be local or global! Now that we have demonstrated that geolocator devices can be safely used to track these small songbirds, we have been approved to deploy a total of 120 units on LOWA and WEWA. From left to right: Worm-eating Warbler, Eliot Berz and Holland Youngman attaching a geolocator on a Louisiana Waterthrush, and a Louisiana Waterthrush wearing a geolocator. Scientific Background – There are many complexities involved in the conservation of migratory bird species. The sheer fact that they spend half of the year in two separate geographic regions, which can often be in multiple countries, can complicate conservation efforts and the acquisition of full life-cycle data. For example, a local population of a specific bird species in the Chattanooga area may be declining, but this could be solely due to factors on its wintering ground in Central America rather than anything occurring in Chattanooga (or vice-versa). In this case, sufficient conservation efforts would require knowledge regarding where the bird spends their time away from the breeding grounds and collaborative international action. New technological innovations like light-level geolocators are one of the means in which researchers can now obtain this imperative "full life-cycle data" and then properly inform conservation action. 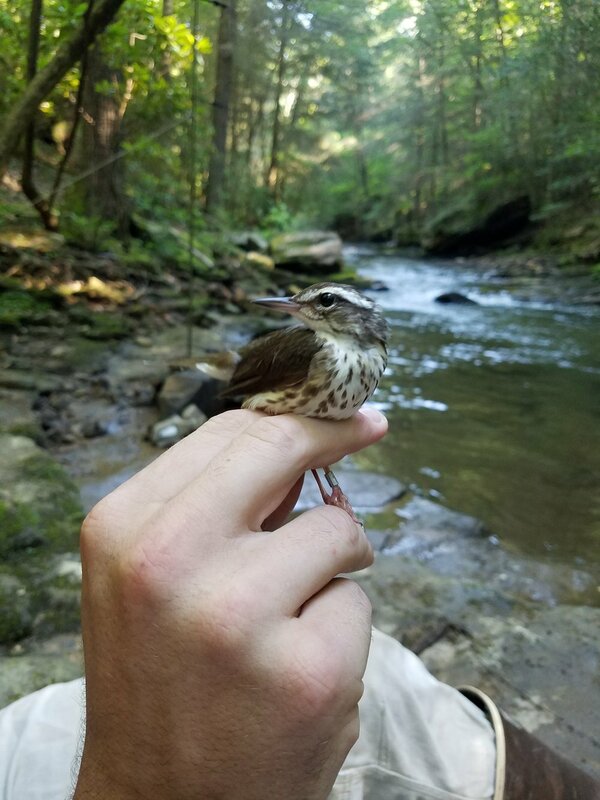 The Tennessee River Gorge Trust and its partners are taking advantage of this technology to answer questions regarding the simultaneous decline and increase of Worm-eating Warblers and Louisiana Waterthrush populations. This project is a collaborative study by the Tennessee River Gorge Trust, University of Toledo, University of Tennessee Chattanooga, University of Tennessee, and Harding University. The project was funded by the Lyndhurst Foundation and the Tennessee Wildlife Resources Agency. Project Overview (content edited from writings by Dr. Henry Streby) – Louisiana Waterthrush and Worm-eating Warblers are two migratory bird species that present a unique research opportunity. These two species overlap extensively in their breeding distributions (eastern United States) and non-breeding distributions (Central America and the Caribbean) in addition to sharing similar breeding behaviors and habitat requirements. Despite their robust similarities, there are many locations across the United States where one has experienced local population increases over recent decades while the other has experienced substantial declines over the same period. For example, in the Tennessee River Gorge’s region, the Worm-eating Warbler has decreased in abundance by greater than 1.5% annually while Louisiana Waterthrush have increased by greater than 1.5% annually over the past 50 years. Conversely, in southeastern Pennsylvania and southern Ohio, the opposite trends have occurred for each species. A 1.5% annual decrease may seem like a small number at first glance, but consider the effect of this percent decline over the course of 50 years; it becomes a much more sobering number. Since one of these species is flourishing while the other is declining in the same areas over the same time period, it is reasonable to hypothesize that the problem may not be occurring here in the United States, but rather on differing wintering grounds in Central American and the Caribbean. Our research collaborators have hypothesized that the locally opposing population trends are associated with differences in the location where each population is spending its winter and the migration routes to get there. Habitat degradation may be occurring at the wintering sites of the declining populations while the increasing populations are not facing such constraints at their respective wintering sites. The research objective is to investigate this issue by tracking the migration of the two species over 4 seperate geographic areas with light-level geolocator devices (Migrate Technologies Intigeo-W55Z9-DIPv9) and DNA samples in order to learn where the locally declining and increasing populations are spending their winters. 2018 Project Implementation: Phase I – After receiving funding from the Lyndhurst Foundation and the Tennessee Wildlife Resources Agency, TRGT moved forward with the purchase of 120 geolocator units from Migrate Technologies. A total of 120 male birds (60 of each species) were successfully tagged with geolocators (15 LOWA and 15 WEWA at each site) by TRGT Avian Technicians, Dr. Henry Streby’s lab at the University of Toledo, and Dr. Patrick Ruhl at Harding University. Equivalent numbers of male individuals were marked with only leg bands at each site to serve as a control group. We used observational parameters such as paring with a female, building of nest, and time of year before capture efforts were made to ensure that each bird was going to breed and remain at the study sites. All birds were captured using mist nets, audio playbacks, and decoys. Upon capture, each individual was marked with a plastic color leg band and federally issued metal leg band. Blood cell and plasma samples were placed in separate storage tubes, flash frozen in the field, and transported to the lab for later analysis of DNA: telomere length (an index of stress and age) and immune response (testing the strength of the immune system). We will complete an exhaustive search for returning birds at each site from March-June of 2019 to find out where the bird migrated! Eliot, a Chattanooga native, received his Bachelor's Degree in Environmental Studies from Sewanee: The University of the South. Before returning to Chattanooga, Eliot worked with a land trust in Northern Virginia. He has enjoyed working and studying within the conservation field, pursuing a variety of forestry and wildlife based projects. Eliot has also worked on public access endeavors on various blueways and greenways, such as the Rapidan River in Virginia and Hiwassee River in Tennessee. When not working, you will likely find Eliot in the river kayaking or fishing. Holland is a native of the South Carolina coast, and a graduate of Clemson University. She has enjoyed working environmental conservation jobs in Wyoming, Mississippi and Texas; and recently left her position with the SC Department of Natural Resources in Charleston to move to Chattanooga. She is thrilled to be here, where she is pursuing her Masters of Environmental Science degree at UTC while working with the TRGT conducting Worm-eating Warbler research. The 2017 bird banding season has come to a close, marking yet another year of avian research conducted at the Bird Observatory! Summer 2017 Banding has begun! Check here for scheduling. Southeast Conservation Corps has been camping out at the Bird Observatory this week cutting trails to aid in bird-banding operations! The Trust bird lab has its very own logo! Designed by our Cerulean Warbler Researcher Holland Youngman, the logo features a Scarlet Tanager, a common nester in the Tennessee River Gorge. We'll be getting official Bird Observatory shirts with corresponding logo for all of our researchers! Yesterday, the Trust purchased a radio telemetry receiver for use in our Cerulean Warbler 2-Year Survey with a grant from the Tennessee Ornithological Society. This season, researcher Holland Youngman will be using radio telemetry to track the foraging habits of Cerulean Warblers in the Gorge. Yesterday, a crew of 15 met at Velo Coffee Roaster's parking lot to carpool to the Trust's new bird lab. We parked, hiked in, and Velo's John Fentress made coffee for the group while bird-banders Lizzie Goodrick and John Diener educated the group on all aspects of bird-banding. We caught some great birds! Check out our latest bird-banding photos on Facebook! (You don't need Facebook to see these).